Not everything is climate change. A little later we’ll talk with one of the world’s top disaster experts, Robert Muir-Wood about his new book “The Cure for Catastrophe: How We Can Stop Manufacturing Natural Disasters.” By the way, my newest song “Wholly Nature” can be heard in this program, and downloaded at the bottom of this blog. Download this program in CD Quality (56 MB) or Lo-Fi (14 MB) or listen to it right now. When the banks and investment houses started to collapse in 2009, I saw once again how flimsy this civilization is. It wouldn’t take much to stop those food truck rolling, and there are no food warehouses in cities any more. A few decades ago I learned to grow and save my own food. In 2009, I resolved to do it again, and we’ve made some progress. But even if this crazy world keeps rolling on, according to the Center for Disease Control, industrial food is killing thousands annually. With all that sugar, salt and fat (not to mention chemicals Nature never planned for) – more than a third of citizens in many countries are obese. It’s not just America. Then there’s diabetes and an epidemic of food allergies never seen before. Too many people are malnourished in the midst of plenty! Meanwhile, chemical fertilizers and motorized agriculture is eroding the soil, wrecking water tables, and loading up the atmosphere with carbon. The food system appears to work for now, but it’s dangerous and unsustainable. I’m growing more and more of the food we eat. The taste is amazing. Our health is improving. Now I can’t go into most restaurants, or even big grocery stores, without being afraid of what’s in those bright-colored packages. Am I just paranoid? Michael Brownlee is the author of “The Local Food Revolution: How Humanity Will Feed Itself in Uncertain Times”. Five years ago, I interviewed Michael as a leader in the Transition Town movement in America. I think this goes even deeper, reaching into your refrigerator, into your body, and into our troubling future. That’s big. Let’s unpack it a bit. In 2010 I did a program on Concentrated Animal Feedlot Operations, or CAFOs. Is that really what we’ve become in the cities where most people live? Or course it’s great for the few who made it to a patch of dirt to start growing food. But let’s face it, many of our listeners don’t have that option right now. Some work at least two jobs to get by, or they are students or parents with a part-time job on top. Others have health problems, or live in an apartment. How can the millions of people now disenfranchised from the land participate in this food revolution? Michael has some great suggestions everyone can do. By the way, there’s an App for that. A new startup in British Columbia has a web site called “soilmate.com“. Hundreds of thousands of people across North America are already using it to connect up with local farmers, and grocery stores that sell local food. If I were in the board room of a big food corporation right now, I’d have two hopes for defeating your food revolution. First, I would set a bunch of lawyers and politicians against you, along with media articles saying how dangerous local food can be. Then I’d sit back hoping the general population is too lazy, too fearful, or too out-of-touch to change. We’ll see. Michael says that although there are good people trying for the past ten years to get more local food in Colorado, they have a very long way to go. The state is a major agricultural producer, and yet only one to two percent of food eaten by Coloradans is grown there. Most food (including beef) is exported, and the huge majority of what is in the grocery stores is imported. We talk about why, and what can be done. Certainly, the local food revolution means we have to be in it for the long haul. I’d like to add another tiny tip from our own household. When we put away our potatoes, fruit and herbs, we label it as home-grown. Then we call out every local ingredient in a meal. We notice and celebrate every time local food makes it to our plates. Even that can help us grow more local. One place we can look for guidance is into the past, when humans really depended on what they could grow right around them. I’m thinking of the early American colonists for example. They would do things like harvest rhubarb and other roots, and then “force” them to grow in dark winter basements, by adding heat. Can we get more tips from the past? Among my favorite books are the Rural Science Series written by Professor Liberty Hyde Bailey in the late 1800’s, like “The Nursery Book”. That’s where I learned about soil supplements and fertilizers in the days before fossil-fuel-based junk and chemicals. Bailey tells you the straight dope on using wood stove ash, manure and organic supplements. It should be republished, or at least made available as e-books. Here are a couple of articles by Michael Brownlee you should check out. But the main place to look for more is (a) in Michael’s new book, and (b) at this local food shift web site, and at Michael’s web site. I learned about this new book through this excellent review by another Coloradan, Carolyn Baker. By the way, I use her daily news service to help me find good issues and guests for Radio Ecoshock. Nobody needs to die in natural disasters. According to a new book, there is a new science of prediction and risk management that can warn, prepare and save millions of lives in the future. So why isn’t it being applied now? CALIFORNIA EARTHQUAKE RISK: IT’S GREATER THAN YOU THINK (and it can hit the world economy). We begin by talking about earthquakes in California. Robert has some startling news. First of all, the idea of epicenters, those rings shown on the maps by TV news – isn’t what’s important at all! Maybe that’s where the quake STARTED, but what we need to know is where does it hit and do damage. That depends more on the length of the break in the Earth. There’s new science out that shows California is in a far greater risk than previously thought. That’s because a quake on one fault line can jump to another fault line. They are not isolated, and that means there are millions of possibilities for quakes in California. At the very same time, Robert tells us, fewer Californians are buying earthquake insurance. Maybe they can’t afford it, or maybe it’s been a while since a killer quake struck there. Less than 10% of Californians have quake insurance. That means, if a big one strikes, (and it will) – most people’s homes will not be covered. A lot of folks will be wiped out and walk away, resulting to a gigantic threat to the financial system. It could be 2009 all over-again, or worse, Muir-Wood tells us. But the real drive of this book is to show that we humans could avoid so much death and destruction by (a) being real about what and where the threats are and (b) making intelligent adaptations. Just one simple example is for governments to stop helping people rebuild in flood plains. Or… we know how to build structures that can withstand most earthquakes (or fires) – but we don’t do it. We talk about the ever-present risk for people in the developing world. There are strict engineering ways to use concrete with carefully designed metal reinforcing rods, properly installed. That isn’t happening in Mexico, Turkey and so many countries. As a result, schools, homes and factories pancake down killing thousands, or hundreds of thousands. Most of those deaths could have been avoided, Muir-Wood argues. I raise one strange point. Muir-Wood has been an advisor, and contributing author, for two reports by the Intergovernmental Panel on Climate Change (IPCC). Yet his new book hardly mentions the threats posed by climate change. I ask him why not. My take on Robert’s book, and his reply on radio, is that climate change threats are developing over the next decades. The dangers he describes in his book are with us now, and have always been with us. It’s a series of known problems which we can solve, saving lives now. Muir-Wood is far from a climate denier. He just has a more immediate focus, and I think it’s really worth-while. We must remember we live on a dangerous planet, even without global warming. Not everything is climate change. We do talk at length about coastal flooding. Of course I raise Miami, and Muir-Wood lives in Florida. But he’s tired of hearing people talk as though Miami was the only place with a problem. There are big cities in America and around the world who will be dealing with extreme weather and extreme storm surge. Not all of them are right on the ocean either. For example, Hartford Connecticut and Sacramento are two “inland” cities that are really on an ocean storm surge connection. The costs of rising seas, in both money and human suffering, are going to be astronomical. I have several interviews coming up on that. In one coastal village in Japan, only the children taught that lesson survived. They didn’t know the protective sea wall in their village wasn’t high enough. While students in other areas waited for official instructions (which generally said ‘stay where you are’) – these kids started to run toward higher ground. Other kids (and their teachers) followed them. They lived, when children down the same coast did not. Think about those lines when you consider a great many risks these days. 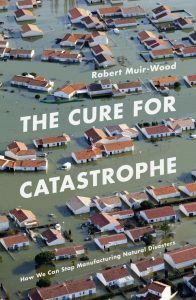 Listeners, I took the time to read all of Robert Muir-Wood’s new book “The Cure for Catastrophe: How We Can Stop Manufacturing Natural Disasters.” It wasn’t a chore, because this stuff fascinates me, and Robert does a great job of keeping us there, in the scene, while we learn. Dr. Muir-Wood is the Chief Chief Research Officer for the RMS Risk Management Solutions, and has a PdD in Earth Sciences from Cambridge University. 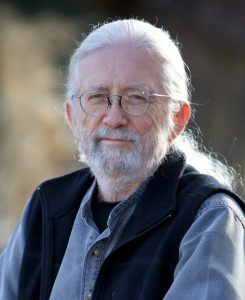 He’s been a lead author in two important reports by the Intergovernmental Panel on Climate Change, the author of six books, and has published over 150 scientific papers. He advises on high levels of business and government on large scale disasters. Download this 24 minute Radio Ecoshock interview with Robert Muir-Wood using these permanent links, in CD Quality or Lo-Fi. You may find this You tube handy to get more from Robert Muir-Wood. He’s talking at the University of Cambridge Judge Business School in a video uploaded on Dec 16, 2011. Thank you for listening to this program. I was a bit shocked by the amount of support coming in from listeners all over the world after my funding appeal. So many of you were generous, and there were some notes which helped me understand how and why you listen, and the topics you think I should cover. I’ll do what I can. Here is a song I’m working on, called “Wholly Nature”, as in wholly committed. very timely to interview Brownlee on local food, he conveyed his message of urgency with aplomb. If this may be a theme for you Alex, in 2018, please consider Dan Kittredge founder of the Real Food Movement and Bionutrient Food Assoc, David Montgomery, geology professor at U Washington, author of Growing a Revolution (2017), http://www.dig2grow.com an advocate for local smaller mixed ag farms, and Albert Bates, permaculturist, ecovillage designer, local food/energy/biochar advocate.